Butte Lake is a section of Lassen Volcanic National Park in a remote corner of the park. It is reached via a dirt road running six miles south of Highway 44. Buttle Lake features a decent-sized campground (over 100 sites), a lake (the aforementioned Butte Lake), and a curious formation called Cinder Cone, a large 700 foot mound of made of loose scoria. It literally seems like a mound made of loose pebbles and dirt. An early morning or late evening shot of the Painted Dunes is best, as the early or late sunlight skimmed over the top of the dunes provides the best light for bringing out the color. But if there is no sun at all, the colors will look flat. 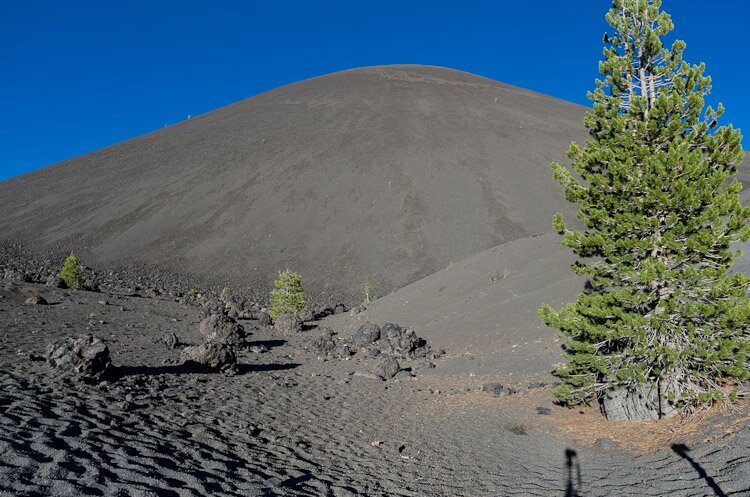 Cinder Cone is a challenging place to photograph. You are expected to stay on the trails, so finding good vantage points from which to photograph the scenery can be difficult. The Painted Dunes are best photographed from above, from the top or the sides of Cinder Cone. They can’t be photographed on the Dunes themselves, as you are not supposed to be traipsing out there where no trail leads.